Why twins? No really, why? I’m often asked this. Twinmaker, Troubletwisters and the Books of the Cataclysm all feature twins (identical, fraternal and mirror, respectively). Then there are the books that feature duplication of people, one way or another in Geodesica, Orphans, The Resurrected Man, The Fixers, Astropolis . . . it never ends. So why? This is a question I’ve often asked myself, and my mum, who assures me there wasn’t a second child in the birthing room that special day. No evidence, either, that I absorbed a twin sibling in the womb (although that does happen surprisingly often). These obvious possibilities rather disappointingly disproved, I’ve been forced to look elsewhere for explanations. The more implausible the better. Maybe I’ve simply forgotten the answer, until now. While talking with my old friend Jeff Harris a couple of years ago, I was reminded of the very first science fiction novel I ever read. The Sky Pirates by Douglas V. Duff was in a stack of Biggles books my father gave to me when I was very young and I devoured it along with the rest. I have no memory of the book itself, it having got lost many moves ago, but the cover was graven on my young mind and, after a quick search on the internet, I found a copy in a bookshop in Hay-on-Wye, where I was due to tour a few months later. Alan switched on the portable radio-set, and grinned at Ralph, his sixteen-year-old twin brother . . .
Could this be it? 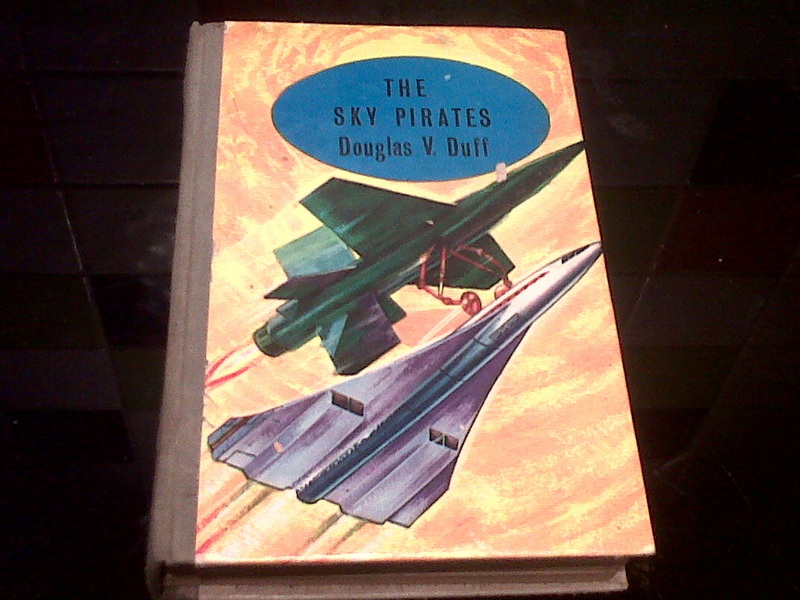 Could the reason I’ve been obsessed with twins nearly all my writing life is because of this, the first science fiction novel I ever read? Maybe I’ll re-read the book. Maybe not, for fear of popping the bubble. Writing about twins is fun (and a great way to explore identity). But perhaps that would be a good thing. It’s probably time I moved onto something new. Triplets, anyone?